As Caltrain celebrates 150 years of continuous passenger rail service between San Francisco and San Jose this year, transit planners are finally preparing to modernize the service by converting from diesel to electric trains. This transition, which Caltrain aims to complete by 2019, will reduce travel times for passengers because electric trains can accelerate and decelerate much more quickly. A typical all-stops local train trip from San Francisco would be reduced from about 90 minutes to 80 minutes. Caltrain has long promoted electrification of the passenger rail line because electric trains are cheaper to operate and maintain — and because faster service will attract more riders and bring in more revenue. But one very important technical detail was missing from the agency’s plans until recently: Level boarding. Currently, passengers need 55 seconds at each station, on average, to get on and off the newer two-step Bombardier train cars. The electric trains set to be purchased in 2015 will also include two steps unless the platforms at all 25 stations between San Francisco and Tamien in San Jose (the section planned to be electrified) are re-constructed 17 inches higher than they are today. Level platforms would allow large groups and passengers with bulky items such as bicycles, strollers, suitcases, and wheelchairs to board more quickly. That would save at least 15 seconds per station, shaving an additional five minutes from the all-stops San Francisco-to-San Jose trip. Stairs are also a safety hazard, especially when getting off the train, and they create an obvious accessibility problem for the elderly and the physically challenged. State lawmakers allocated $600 million from the California High Speed Rail project to Caltrain in July 2012, providing nearly half of the $1.5 billion cost of the Caltrain electrification project. The agency is now tasked with designing the electrification infrastructure and choosing which trains to purchase in 2015. Caltrain also faces regulatory hurdles to level boarding. 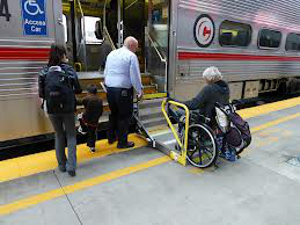 New passenger rail systems must include level boarding, a requirement of the Americans with Disabilities Act, but Caltrain is exempt due to older regulations governing freight rail, which still operates on its tracks. 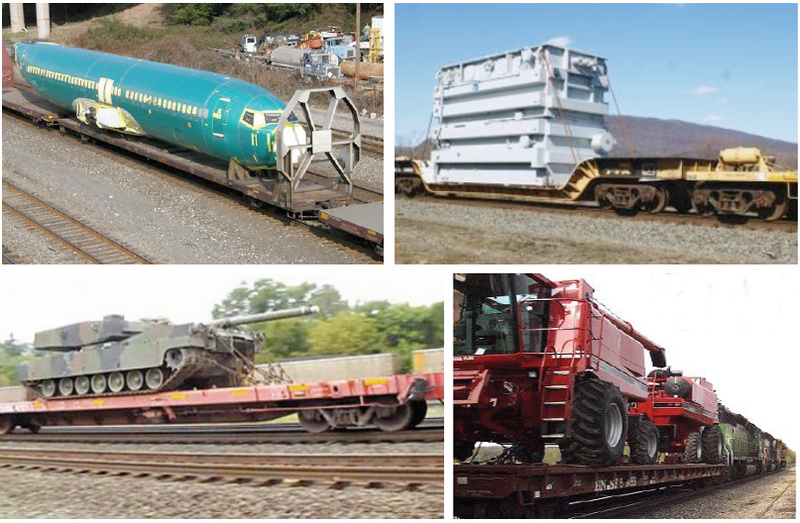 The California Public Utilities Commission General Order 26-D actually prevents level boarding from being implemented because it specifies setbacks between the platforms and freight trains in order to ensure the ability to transport large items extending over the sides of a train, such as airplanes, tanks, tractors, and other industrial equipment. Fortunately, this type of freight isn’t transported on the Caltrain tracks due to the lack of large manufacturing or agricultural facilities in San Francisco or the Peninsula. But General Order 26-D still applies to all lines that carry any freight in California. A waiver to exempt Caltrain from this requirement would need to be granted by the California Public Utilities Commission, which the rail companies (Southern Pacific and BNSF) might oppose since their priority is to maintain maximum flexibility for freight operations. Having been lobbied for months by the advocacy group Friends of Caltrain, the agency finally stated in late September that level boarding is one of its goals for the electrification project. Funds to re-construct the platforms could be generated with a November 2016 ballot measure. Before that happens, though, the travel time benefits and construction cost would have to be accurately assessed, and the regulatory hurdles would have to be overcome. For however many millions we can apparently speed up the transfer from Caltrain to BART with level boarding. Level boarding won’t really add a lot when there are a mere 2 clipper readers on the Caltrain platform at Millbrae, strategically situated as far as possible from the BART gates. If they want to make this transfer quicker, all they have to do is make BART entry via Clipper automatically end your Caltrain trip on Clipper. And put 2-3 readers near the BART gates where they belong. Of course, I was told this was impossible due to a “wiring issue” a.k.a. because of bovine feces. Isn’t CSHR going to be sharing the tracks with Caltrain? Was the plan there always to have CSHR cars be non-level like Caltrain cars? That will be another $0.5 million change order like what BART had done to stop people from exiting with negative value (no more $5 BART ride to airport). Electric trains also don’t spew diesel particulate matter, are more energy-efficient because less energy is lost in the engine as heat, are quieter, and can be powered with renewable, non-carbon emitting energy sources. Level boarding would certainly decrease my boarding/unloading time–I have a heck of a time getting my bike on and off Caltrain (although the two step trains are easier than the 3–or is it 4?–stair trains.) Of course, if Palo Alto/Stanford had a reasonable density of bike share stations, I might not need to bring my bike on board at all. I never said that Caltrain, BART, and the MTC thought this through very well from the beginning…. Thank you for covering this issue. Level boarding would provide many major benefits for all Caltrain riders while helping to grow Caltrain’s ridership by making its trains more easily accessible for all. Bart trains don’t use gap filler steps. Why does Muni and CalTrain need them? In the Los Angeles area, all the Metro light rail lines have level boarding, but the platforms are built for cars that are quite a bit narrower than “main line railroad” cars. When the Gold Line to Pasadena was completed, a fellow railfan asked if private passenger cars could be run to Pasadena for the Rose Parade, which was done back in the Santa Fe days. I told him that the car would get as far as Lincoln Heights or Chinatown, and there would be an awful CRASH! as the wide car hit the platform. This is also why a preserved Pacific Electric car from OERM wouldn’t work. That said, the high platforms are a major boon to wheel chair users, mothers with strollers, and travelers with heavy baggage. BART is a closed system with no other trains (i.e. freights, Amtrak, etc.) able to access its non-standard broad-gauge rail infrastructure. Therefore BART is not subject to the same state and federal rules governing railroads. You can have wide cars and high level boarding. Width and platform height are independent choices. BART’s doors sit on top of the floor/sill, and slide into pockets. But even if they opened outside the car wall, a key difference with MUNI is the doors also extend down below the platform (for street-level operation when the steps are lowered). If the doors stuck out beyond the car wall when closed, one could probably bring the floor out a little more flush with the exterior wall, but you’d still need a door thickness worth of gap because they go down to street level. You left out your other suggestion, that cyclists be given boarding priority at the bike car entrance. This entrance is shared by cyclists and non-cyclists, but it’s not atypical the first cyclist doesn’t even enter the car before some of the other entrances are empty. This is because the front car is the shortest walk exiting the train from either SF stop, and so non-cyclists preferably choose it. But as a result lag times at every cycling-popular stop suffer. And that change costs virtually nothing. Muni having high-floor trains is one of the dumbest mistakes in modern municipal transit history. Bicycles shouldn’t be on Caltrain anyways, from an optimum operational viewpoint. CASHR trains will not stop between San Jose and SF, and they will have their own platforms in San Jose. They should make sure that Caltrain and HSR have the same platform height since it would add more platform flexibility between the two companies in the new Transbay Terminal. Might want to talk to Redwood City about that, it’d be news to them. CHSR will share tracks with Caltrain according to the blended system design that was included in the approved HSR plan. The current proposal is for HSR to have separate new platforms (which presumably would be level-boarding). The Caltrain High Speed Rail Compatibility blog argues that San Jose/HSR would be able to save a lot of money at the Diridon station if there were compatible platforms. But currently, the City and HSR are happy with the expensive design proposed for the late 2020s, and nobody’s looking to save money yet. From an optimal operational viewpoint, homes and jobs should be within a half-mile radius of the station instead of 1-3 miles away like they actually are. Which is why 12% of Caltrain riders use a bike to get to Caltrain and 10% bring the bikes onboard. Apparently Cubic charges a half-million change order for just about anything. Nice work if you can get it. Cubic’s contract is up some day. Ideally they should. The issue is that some people already presume HSR will use high floor vehicles (similar to those in the Northeast) and therefore they believe that Caltrain should raise platforms to that height. This bucks the current trend of using low floor vehicles (nearly all commuter rail in the West Coast and new light rail use low floor vehicles). I think that HSR should instead use low floor vehicles and be compatible with Caltrain in that aspect, and never the other way around. The benefits are not worth the costs for Caltrain to go Northeast. Your response is too abstract. You need to look at the total resource taken up by a passenger: compare cyclist, someone who drives solo to a station and parks, and someone taking a shuttle from a station. Parking is limited and >$50k/space. Shuttle stops are limited and generally fully utilized. A cyclist takes up neither, but takes up more space on the train. Since on the vast majority of non-baseball trains the passengers are not seat-limited, there’s room for some bikes on board, and allowing them there frees up parking and shuttle-stop space. “Kiss-and-ride” creates congestion @ stations: every try to go close to a local school @ 8 am? Even riders taking MUNI use up a valuable resource: the bus will fill and will run late due to increased lag times at stops. So yes, from an “operational standpoint”, everyone would walk to/from the train at each end of the trip. But I reference aslevin’s response. Compared to most other passengers, bikes on board isn’t such a bad deal. I’m not opposed to use of bikes to reach station. However, bike sheds should be provided so that people lock their bikes and continue their trips on train without them. Bikes on board only work if the number of people using that option is exceedingly small to matter. If there were like dozens of people wanting to do that on every train, there would be a problem. It is not a scalable solution. You obviously have never traveled on Caltrain before. On each train there is an entire car where seating has been removed from the lower level to provide space for people with bicycles to travel. 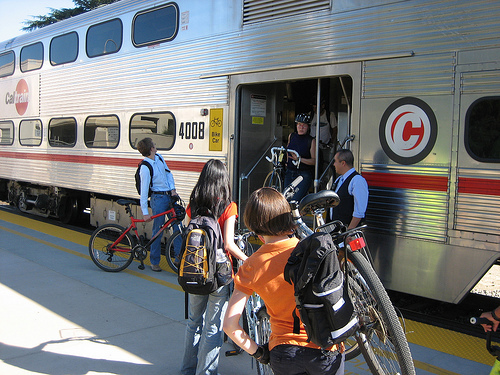 This isn’t an issue where only 1 or 2 bicycles are being transported in each passenger compartment, but rather numerous people are taking their bicycles on Caltrain in the bicycle cars to be used when they reach their destination, solving the final mile solution at either end of their journey. Also, at the San Francisco end, there is a bicycle storage facility that provides an all day safe lockup. Yes — and the SF bike storage facility runs at capacity. There’s so much latent demand for riding bikes to the train, that the increased capacity this created was gobbled up by latent demand = more passengers for Caltrain, but still the bike cars fill. I agree this sort of approach should be provided at every tier-1 station. It’s not a total solution, however, but rather a supplement to on-board capacity, which is inherently limited. There are serious technical problems and restrictions that would come with low-floor high-speed trains. You just can’t fit all the machinery on the typical fashion you can do with light rail. From an optimum operational viewpoint there should be no passengers at all. But then we would also have zero fare revenue. The goal of a system is to balance all the various goals in the system towards their utility function. Caltrain needs to optimize for safety, maximum ridership, on-time performance, revenue, passenger experience. The bike cars (80 bikes per train) have been a huge boon for ridership and revenue without a measurable impact on the other three metrics. Without that revenue, Caltrain would be running fewer trains, which would produce optimum operations but not be very useful. It’s only an option at the moment, and Prop 1a limited the number of stations they could build. Really? HSR is not going to stop at Millbrae and connect to San Francisco Airport? Wowza. At least put a tiny amount of effort into this. At least one will get built, if not two of the three. At the same time, there are cost as well as technical reasons that many low platform systems have never become fully high platform systems, resulting in a hybrid situation which provide inconsistent passenger experience. If these former PCC systems had low floor technology available, they would’ve become a low floor system rather than hybrid: Buffalo, Pittsburgh, Muni. Many commuter rail systems also have to settle for hybrid boarding situation: NJ Transit, SEPTA, MBTA, Metra Electric. I think at one point all these systems have wanted or even planned to be fully high platform and that hybrid situation is supposed to be interim. The reality is that interim is essentially permanent. It is very unlikely that Muni would ever become a fully high platform or low platform system. Caltrain should never be in a situation where it has to settle for hybrid boarding, so I think it is the best for Caltrain to go low floor. Regardless, high speed rail will be secondary on the Caltrain corridor (in terms of number of stations served and ridership). HSR can choose whichever height it wants but shouldn’t dictate the height for Caltrain. This isn’t just a presumption, it’s an established fact. With resolution #HSRA 13-25 adopted in September, the California High Speed Rail Authority entered an MOU with Amtrak to pursue a joint RFP (Request for Proposals, which signals a firm intent to purchase, i.e. not just an RFI) with the goal of jointly procuring high-speed trains with Amtrak for the Northeast Corridor and California’s phase 1 system. As you may know, the NEC platforms are 48 inches up from the rail and 67 inches out from the track centerline. The RFP anticipates a notice to proceed (specification complete and contract signed!) by 3Q 2014, which is sooner than Caltrain will buy EMUs. Nonetheless HSRA isn’t going to actually purchase any vehicles and operate in California anytime soon. Even if a government agency were to contract with a computer company on a multi-year deal in 2008, they won’t be buying a 2008 computer if the purchase order is placed and the computers are delivered in 2013. Even with an RFP it doesn’t mean that rail operators want a single design for all of the vehicles (like Amtrak doesn’t need 220mph trains). The proposal can include different standards or that designs could be changed down the road. What they want from the joint RFP is to get a commitment from a qualified manufacturer to build trains in the US, and that Amtrak and HSRA will work with that company for all purchases rather than going out to bid every single time. For a winning bidder, that company will have the confidence of knowing they will get enough business to justify establishing a manufacturing capacity in the US. The resolution is that simple, but you’re trying to interpret that HSRA plans to use NEC trains. It may be or it may not be. Caltrain should pick a standard that works best for its riders and the communities. Even if HSR were to choose an outdated standard of 48″ doesn’t mean that Caltrain should follow such idiocy. If HSRA and Amtrak want the same trains and know exactly what to have for these trains, they would go for an invitation for bid rather than an RFP. An RFP considers a wider range of qualifications and proposals, so it doesn’t necessarily preclude different designs if the manufacturer can offer different designs. Andy is making several assumptions that are incorrect. (1) an RFP is not an RFQ or RFI. It is indeed an invitation for bids, with intent to place a firm order in 2014. The present RFQ is not to be confused with the RFI (request for information) that already went out in January of 2013. (2) Amtrak is in fact seeking 220 mph EMU trains, to enable higher speeds in the future as various sections of the NEC are improved. They are not in the market for another 150 mph Acela replacement. (3) The California IOS (Merced to San Fernando) is planned to open for passengers in 2022, which does not leave as many years as one might initially assume. The RFP envisions ordering in 3Q 2014, prototype production complete in 2018, testing complete in early 2020. The California IOS fleet requirement would be for 27 trains. To make a long story short, California HSR is buying high-floor trains. No ifs and buts about it. As for 48″ platforms being “idiocy”, I’ll call that hyperbole that doesn’t exactly make for a constructive discussion of this important issue. RFP is not a bid for a product on price point only, but a bid that involves a variety of factors, including design. Transit agencies typically use RFP to buy new buses in various batches over the course of several years. Obviously when a transit agency does it not all the batches are identical because design for buses and their components change. Transit agencies use the same RFP to buy low floor buses even when the RFP was intended to buy high floor. So is the RFP going to be a barrier if and when HSRA decides to go low floor? It shouldn’t be. 48″ is backwards because almost every existing rail system that chose to have full high platform at some locations end up having to settle for hybrid boarding. I am against Caltrain to turn into another Muni Metro and I bet that many would rather have Muni Metro to be fully low floor rather than the hybrid situation that it got stuck in. Double deck high floor cars have poor interior circulation and bike access. It would result in other bottlenecks to offset whatever improvements level boarding is supposed to have. Having cyclists to navigate interior stairs inside a moving train with their bikes is a serious safety issue. There’s no reason for Caltrain to choose 48″ other than having the option to share platforms with HSR (which is conceivably useful in Transbay), if HSR plans to use high platforms and options like adjustable platforms are not chosen. For you, you think that Caltrain should let HSR pick the standard and that Caltrain should do anything to meet that standard. I am not against having HSR and Caltrain have compatible infrastructure, what I am against is choosing a standard that won’t work well for Caltrain and the communities. Even if you try to sugar coat it by saying it would save money in Milbrae and San Jose won’t offset the fact that additional platforms may still be needed, that additional platforms are relatively cheap (especially compared to retrofit all platforms), and that things like adjustable platforms are not necessary other than at Transbay. Building the highways had military/industrial motivations. So does maintaining a peninsula heavy rail in times of need. Such as moving debris after the next big earthquake. The key now is letting the new Caltrain electrified EMU’s be low floor and HSR be high floor, since HSR wont be as much of a regional commuter service as caltrain or bart is.